Genesis Series Saunas™ are the safe, effective and affordable way to relieve stress and improve health, right in the comfort of your own home. The Genesis 2 Person Infrared Sauna’s natural Hemlock wood cabin color will compliment any décor, creating the ultimate in-home spa! Our exclusive InfraWave FAR heat technology heaters emit ultra low levels of EMF, safe, efficient and beneficial to your health. “EZ – touch” interior and exterior LED control pads allow for convenient temperature adjustment. Loaded with tons of “Value Added Extras” - including towel hooks, magazine rack, CD player with mp3 plug-in, 2 speakers, backrests, 7 color CHROMOTHERAPY light and an oxygen ionizer. A perfect opportunity for ultimate relaxation while receiving all the health benefits the Genesis sauna will provide. Features 6 carbon heaters (1,600 WATTS) - Energy efficient - high quality heaters means your Genesis Infrared Sauna™ is more effective! Made of premium grade solid Hemlock wood and constructed with tongue & groove joinery for superior edge to edge strength and durability. Equipped with "EZ - Touch" Interior and Exterior LED Control panels - easily adjust your sauna settings from inside or outside. Comes standard with a pre - installed user friendly radio with CD player, AUX mp3 connection and built in speakers. Include 2 backrests, ergonomically designed to eliminate fatigue and discomfort and provide ultimate sauna relaxation and comfort. Comfortably seats 2 people on the extra deep bench that runs along the back wall of the sauna. 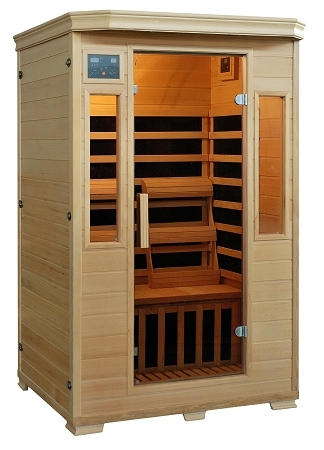 Once assembled the 2 person Genesis sauna measures approximately 49"x39"x75" and weighs 354 lbs. Genesis Saunas™ are proudly backed by CE, CETL, RoHS and ISO 9001 certifications, internationally-recognized seals of quality, safety, and professional manufacturing.